2.0 Movie opened with tremendous response at global box office. Here are the Celebrities shared their feelings about 2.0 Movie on Social Media. Congratulations on #2Point0 Marvellous creation it is! @rajinikanth sir @akshaykumar sir @shankarshanmugh sir ?????? So proud to be associated with this movie marvel!!!!!!! #2PointO @shankarshanmugh #Rajnisir @akshaykumar !!! You lived the character to perfection sir @akshaykumar And a salute to god’s child @arrahman The genius behind the camera @niravshah112 art @Muthuraj sir and my dear friend @iamAmyJackson for being a part of this epic film ???????????????? Best wishes to all the giants of #2point0. It’s biggest of the biggest!!! 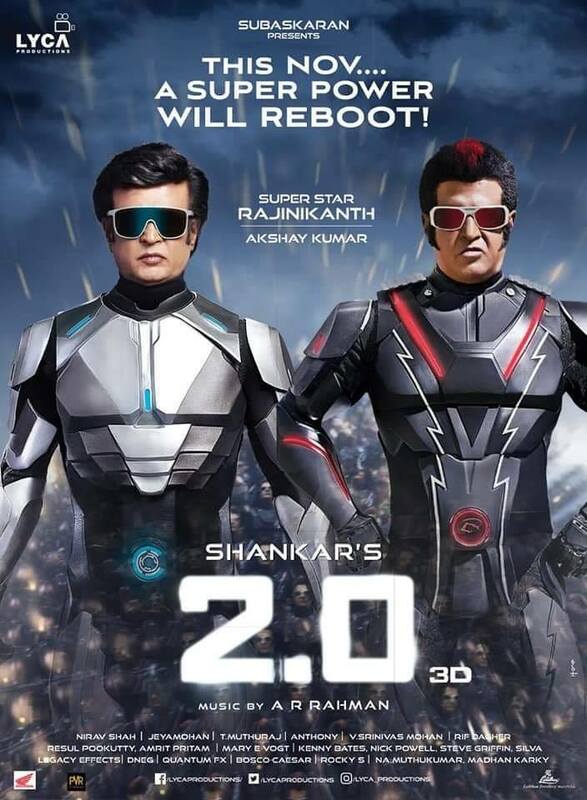 Best wishes to superstar @rajinikanth , director @shankarshanmugh , superstar @akshaykumar and the entire team of #2Point0 .. courage, vision and excellence must always be rewarded ???? Magnitude and scale is going to match the box office it seems huge numbers coming from every where Thalaivar @rajinikanth is setting the screens on Fire…. ???? #2point0 This film 🎥 will be celebrated for life Only @shankarshanmugh can bring dream this visual wonder on the screen Watching it in #3d was spectacular especially the titles part gave the super high and continued till the END !! @LycaProductions ♥️🍀 It’s a proud moment ! #2point0 go enjoy the experience at the theatres! Exhilarating experience, #2Point0 in 3D. Great visualisation & fabulous execution by @shankarshanmugh sir. Hats off @arrahman and the whole team. @rajinikanth sir is #Thalaivar for a reason ! Simply wow ! Follow us to read more latest info about 2.0 Movie Review and News updates on Amaravathi News Times. Prev2.0 Starts with Earth shattered openings on First day!